The trombone can be found in the brass sections of marching bands, jazz big bands, orchestras and military bands, and players such as Slide Hampton and Jim Pugh have become famous for their virtuosic trombone playing. By learning what the normal and extended range of trombone you will be better prepared if you decide to learn this brass instrument or write a piece of music for the trombone. The normal playing range of the trombone is from the E below the bass clef to the Bb above middle C.
Experienced players can often reach an F note above middle C, which extends the range of the trombone by a perfect fifth. Trombones can also have an added trigger that allows the player to reach a low C note, below the bass clef. The bass trombone has a second trigger that allows the player to reach a low B note, as well as a low pedal F note. 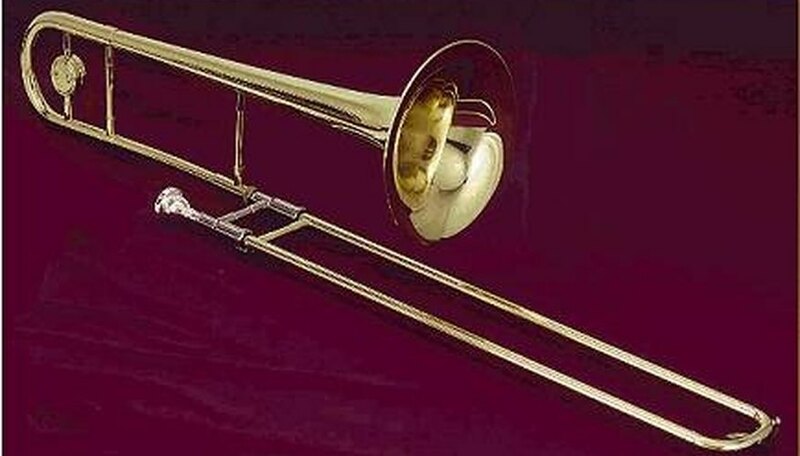 The modern trombone is modeled after an older instrument named the Sackbut, which when translated from the original French means "Push-Pull," because of the instruments slide.